When you want those fancy sport jackets and blazers that you see Celebrities and Entertainers wearing, Manzini is the brand that makes them happen. Manzini knows all about stunning style and fancy looking tuxedo jackets and they make the best around. 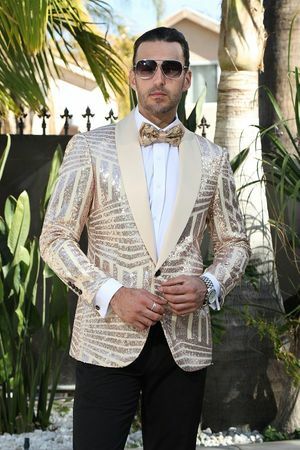 This beige color tuxedo jacket blazer has a round shawl collar and a modern fit that just makes it happen on the Red Carpet. Side vents in the back finish the look.